essentially reteach high school– and junior high school–level content in reading, writing, and math. 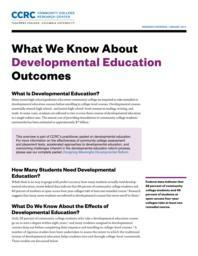 In some cases, students are referred to two or even three courses of developmental education in a single subject area. The annual cost of providing remediation to community college students nationwide has been estimated at approximately $7 billion.